The world’s most unique creatures are in the house on Currituck property. Visitors to the OBX Lizard Land appreciate all things creepy and crawly. The serpentarium contains both reptiles and amphibians native to local areas and around the world. Families who dare to venture in find themselves meandering through a vivid collection. OBX Lizard Lane was “created to educate the public about the beautiful creates from around the world to in our own backyards.” Working off of this mission, a dedicated hands on staff is ready and eager to impart their knowledge on each animal inside the building. Their passion comes true as they provide demonstrations and answer questions as they are posed. Hop on over to where the frogs are. A variety of colorful amphibians jump out at visitors including the Dyeing Poison Arrow Frog, Bicolor Poison Dart Frog and Blue Poison Dart Frog. Slither up to the snakes. Learn all about the similarities and differences of boas, pythons and cobras. Favorite snakes to observe include the Giant Madagascar Hognose, Baron’s Green Racer and False Water Cobra. Many different species of monitor lizards roam the globe. Habitats on the grounds contain examples of the Nile Monitor, Green Tree Monitor, Black-Headed Monitor and Peach Throated Monitor. 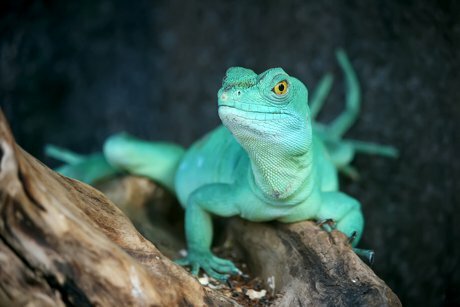 Other reptiles worth taking a glance at are the Veiled Chameleon, Frilled Dragon, Blue Tailed Skink and Day Gecko. A number of the critters calling Currituck home were rescued animals. Guests learn all about their histories as well as fun facts about their species, habitats and care. Feedings are fine times to gather insight about the characteristics of the animals here. Animal ambassadors are out and about. Interactions also allow patrons to hold some intriguing snakes and lizards. OBX Lizard Land is a great place for Currituck property owners to host birthday parties for their kids. Youngsters will go wild with all the fun in store. Party packages include animal interactions with up to nine creatures, feeding demonstrations and tickets to the center. Field trips and school presentations are also great educational experiences. The serpentarium is open six days a week. Hours are weekdays from 11a.m. to 5 p.m., Saturdays from 11 a.m. to 5 p.m. and on Sundays from 12 to 5 p.m. The museum is closed on Tuesdays. Leap on into the land of lizards today!